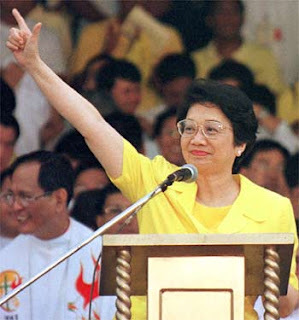 Former Philippine President Corazon Cojuangco Aquino has passed away. Her son Sen. Benigno “Noynoy” Aquino III confirmed that she died of cardio-respiratory arrest at exactly 3:18 a.m. Saturday at the Makati Medical Center. Mrs. Aquino has been diagnosed with colon cancer early in 2008 and has been confined at the Makati Medical Center for more than a month. Mrs. Aquino, widow of Senator Benigno Aquino Jr., will be remembered as an icon of democracy, having led a military-backed popular revolt in 1986 that ousted a dictator who ruled the country for 20 years. At about 5 a.m. outside the hospital, Noynoy read a statement announcing the death of his mother. President Gloria Macapagal-Arroyo expressed her condolences to the family of the former President, Arroyo's press secretary said. The President is set to declare a week of national mourning, said Press Secretary Cerge Remonde in a live phone patch from the US where he is accompanying Arroyo who is on official visit there. Remonde said the President could cut short her trip but that they were going to discuss the matter when they get to New York, their next stop after Washington D.C. where she met President Barack Obama at the White House. Arroyo is expected to be back in Manila on August 5. Remonde also said that under the law, all presidents were entitled to a state funeral but added that this would be subject to the family's approval. "Kris was very quiet. She was displaying such courage pero noong dindadala palabas mga labi ni Tita Cory... because you have to remember that Kris was in the hospital, Kris was by the side of her mother since July 20 hanggang sa mga oras na yun. Hanggang ngayon si Kris ay nasa tabi ng kanyang ina," Abunda said. He said a Mass, officiated by Fr. Catalino Arevalo, was held after Mrs. Aquino's death. Abunda said Arevalo is a very close friend of the former leader and had been officiating a Mass for her at the hospital. A family driver of the Aquinos was seen loading stuff into a white Toyota Hi-Ace van parked at the back entrance of the hospital. He said the boxes and luggage belonged to Kris who left the hospital early Saturday morning.